Christmas is just around the corner… no seriously it’s next week! And we at Make a Birthday Wish are extremely excited for all the love and giving that takes place this time of year. If you are still lost for gift ideas, then have no fear, we’ve got a collection of great resources to help you make a great gift for just about anyone on your list (even the person that has everything!). The best part about this gift idea, it is practically free (except for the paper it’s printed on) or close to it. Kodak’s Gift Coupon Book Tutorial & Templates – these are great if you can’t think of your own coupon’s, or you aren’t so handy with drawing or handwriting your coupons. Balancing Beauty & Bedlam’s Homemade Coupon Book Templates – a great template that has premade coupons and gives you the option to create your own! Soakworthy’s Coupon/Voucher Ideas – this post has a lot of great ideas for unique coupon or voucher formats, including buttons and tags. Definitely a great place to get some inspiration. SevenThirtyThree’s Coupon Book – a free printable beautiful coupon book for dad’s, would be great to print for little one’s to give to their dad’s or grandfather’s! 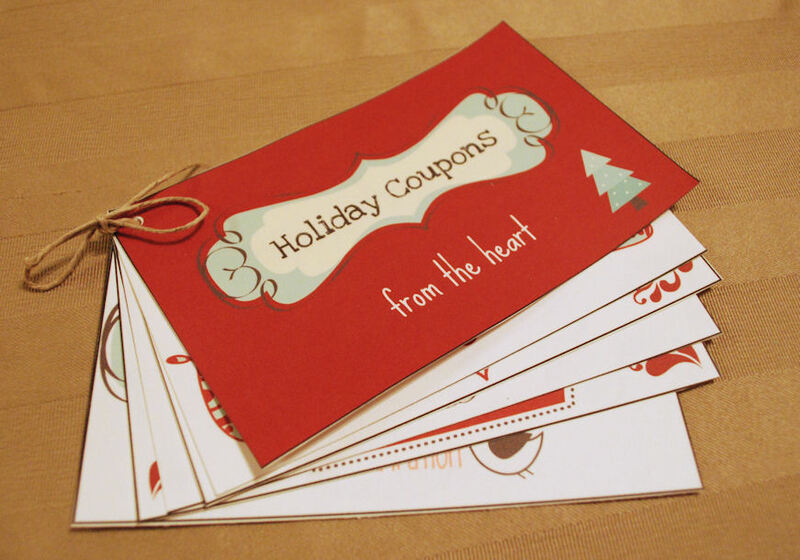 Have you ever made your own coupons or vouchers before? What kind of coupons did you come up with?